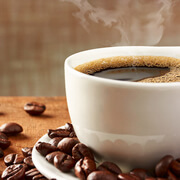 drinking two cups of caffeinated coffee per day was linked to a 35 percent reduction in HCC risk, while the risk of HCC was halved with consumption of up to five cups of caffeinated coffee daily. We're not suggesting that everyone should start drinking five cups of coffee a day though. There needs to be more investigation into the potential harms of high coffee-caffeine intake, and there is evidence it should be avoided in certain groups such as pregnant women.